Chef Michael Pancheri shares a delectable taste of the farm to table concept of allium restaurant + bar in Great Barrington, Massachusetts, in The Berkshires, with his recipes for Chickpeas Crisped in Hot Oil; Mixed Green Salad with Candied Pecans and Lemon Thyme Vinaigrette; and Wood-Grilled Berkshire Pork with Great Northern Beans, Winterbor Kale and Honeycrisp Applesauce. The Berkshires region of New England has become a culinary center for foodies with its fresh produce, meat, and dairy farms, its organic focus, and farm to table restaurants. Chef Michael Pancheri, a native of Connecticut, clearly has caught on to that concept. 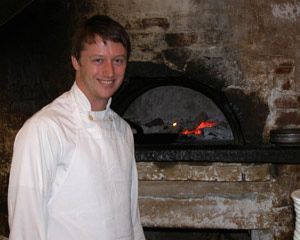 After first honing his career at legendary restaurants in New York and Boston, including Gordon Hammersley's restaurant, Hammersley's Bistro in South Boston, Frank McClelland's restaurant, L'Espalier in Boston, Wylie Dufresne's restaurant, wd-50 in New York, as well as working in Nantucket and at Foxwoods in Connecticut, he joined the allium restaurant + bar team as the Executive Chef in April 2009. I met the very personable and passionate Chef Michael Pancheri in November 2009 while I was having dinner at allium restaurant + bar and had the opportunity to get to know this dynamic and talented chef. Starting work in April provided Chef Michael with the opportunity to experience spring in The Berkshires when nature was just beginning to wake up, and watch it develop across the seasons yielding its wonderful bounty of the autumn harvest. At allium, he works closely with the fishmongers and the farmers of the region who bring him their prized products, which in turn he cooks to perfection. He said that on any given night it is not unusual to see one of the fishmongers or one of the nearby farmers having dinner at the restaurant who want to experience the farm to table concept and see the final result from their initial labor. Chef Michael Pancheri shares a delectable taste of the restaurant with his three-course menu showcasing products of the region. Bon Appétit! Method: Process chickpeas in food processor with onion and garlic in small batches. Transfer to a deep rectangular stainless steel (hotel) pan. Mix in remaining ingredients and season with salt and pepper. Allow mixture to dry slightly before using an ice cream scoop to make balls. Heat oil to 350° F (177° C) in a 4-quart (3.8 liters), heavy-bottomed pot. Drop balls into hot oil and cook for 4 minutes or until crispy golden brown. Remove from oil and drain on plate lined with paper towel. Serve immediately. Method: Wash greens thoroughly and drain well. Use a salad spinner, if available. In a large mixing bowl, toss lightly with Lemon Thyme Vinaigrette and place on four salad plates. Sprinkle 6-8 candied pecans over each salad and serve immediately. Method: Whisk Dijon mustard, honey, egg yolks, and lemon juice in a bowl. Slowly drizzle in oils to emulsify. Add thyme leaves, salt and pepper to taste. Method: On a sheet pan, toast pecans for 7 minutes in a 325° F (163° C) oven. Remove from oven and place in a bowl. Toss with corn syrup, cayenne, cinnamon and nutmeg. Place coated pecans on sheet pan and toast again for 7 minutes at 325° F (163° C) until candied. Allow to cool and dry. Method: Soak great northern beans overnight in cold water in refrigerator. The next morning, strain beans and place in pot. Cover with cold water; in a cheesecloth add rosemary, bay leaves and peppercorns. Simmer until tender, approximately 45 minutes to 1 hour. When tender, remove from heat and allow beans to cool in liquid. Add salt and pepper to season liquid and beans. Grill pork chops over wood fire for 5 minutes each side, rotating 90 degrees after 2.5 minutes on each side. Then place in 325° F (163° C) oven for 35 minutes until medium rare. Remove stems from Winterbor kale and roughly chiffonade the leaves into ¼-inch thick strips. Heat olive oil in sauté pan with garlic. When the edges of garlic begin to turn golden brown, add pinch of red pepper flakes, salt and pepper. Add a handful of clean cut kale and a big handful of white beans. 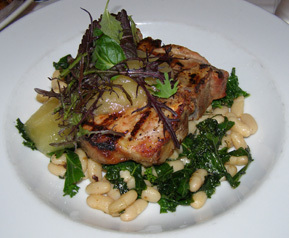 Sauté until kale is wilted and beans are warmed through. Finish with a pearl of butter and check salt and pepper levels to taste. Method: Warm all ingredients over high heat in a heavy-bottomed (rondeau) pan until soft, stirring with whisk. Season and slightly puree in food processor. Bon Appétit! 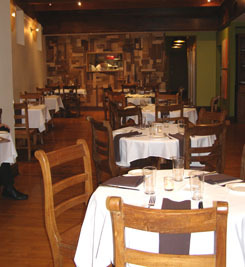 Read about allium restaurant + bar in the Restaurants sections.